Time to Reclaim 9000 acres in Allegany State Park from Gas Leases! The gas storage facility in the Allegany State Park damages natural resources. Our New York State Parks are treasures that belong to the people of New York. They offer peace and tranquility for hiking, camping, canoeing, and the enjoyment of a natural setting. Our parks were never intended for industrial use. The trees that grow in the park have become victims of clearcutting leaving barren patches around the 14 storage well heads. A tangle of roads slices up the forest. Counting roads and well heads, 50 of the 9000 acres have been stripped of their trees. What could be a hundred-year-old intact forest has fallen victim to the fossil fuel industry. This Gas storage lease in the heart of the park which contains much of Allegany’s old growth forest. National Fuel has advertised its intention to expand the facility. This park’s wild forest should provide recreation and animal habitat and not be dominated by industry. 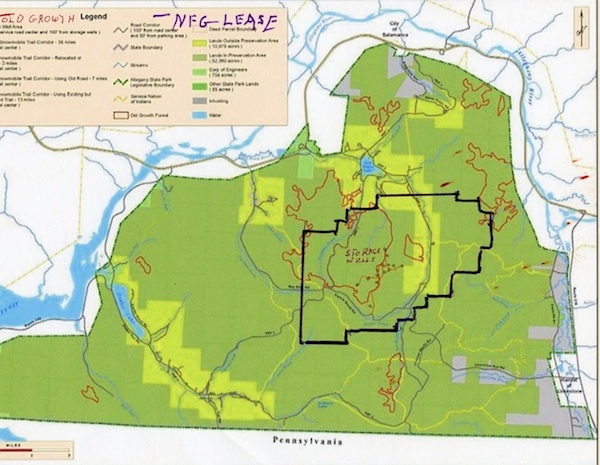 The map below of Allegany State Park shows the extent of the National Fuel Gas Storage lease in Allegany State Park and the Old Growth forest is controls.